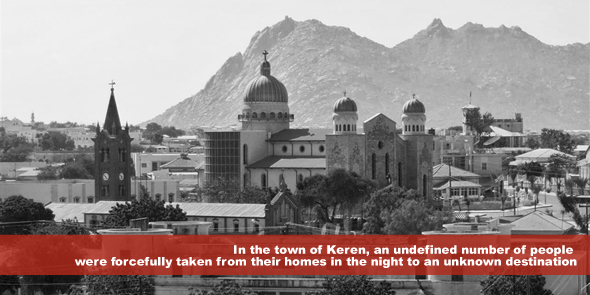 During the month of August 1994, in the town of Keren, an undefined number of people were forcefully taken from their homes in the night to an unknown destination, allegedly by security officers and soldiers. Many of those kidnapped were elderly men, several of whom where teachers of Arabic. The most distressing aspect is the shroud of secrecy covering these kidnappings. Families have no information of the ‘disappeared’ from Keren and still question the fate of their loved ones some twenty years later. September 2014 marks the thirteenth year since the known victims of the Eritrean government’s clampdown on opposition and media disappeared. I speak here of the infamous ‘G-15’ group of senior government officials whom in 2001 wrote a public letter critiquing the government. The government retaliated by detaining them and 18 journalists incommunicado – none have been heard of since – many are presumed dead. I say known victims of enforced disappearance as many more Eritreans from all walks of life have since been unaccounted for. Hundreds of people, be it political prisoners, prisoners of conscience, journalists, religious leaders, ‘deserters’ (attempting to flee the country), or anyone critical of the government can disappear into the vast secret system of detention in Eritrea without information. everyone is indefinitely conscripted from the age of 18 years up to 50. Implementation of such levels of repression negatively impacts on everyday life, with the result being; ‘disappearances’ are regularly used as a weapon for instilling fear and terror in a population. Enforced disappearance carries with it severe consequences: an assault on a person’s right to identity, security, liberty, protection from torture, inhuman or degrading treatment or punishment, and their right to judicial guarantees vanish instantaneously. Worse yet, for the loved ones and family members of the disappeared, they live with the not knowing – denied the truth – forever questioning: are you alive? How do we bury an empty casket? Will you ever come back? “No exceptional circumstances whatsoever, whether a state of war or a threat of war, internal political instability or any other public emergency, may be invoked as a justification for enforced disappearance” (International Convention for the Protection of All Persons from Enforced Disappearance, 2006); a legally binding commitment to which Eritrea is still not party to. Let today be a reminder that the prisons may be secret and locations unknown, but the ‘disappeared’ are not forgotten. Furthermore, in light of Eritrea’s non accession to the Convention for the Protection of All Persons from Enforced Disappearance to guarantee accountability, international clamour and action has become a more pressing, more obvious necessity. Thato Motaung is a researcher in the fields of gender, peace and security and human rights on the African continent. Prior to working for the Centre, she was a Research Fellow to the African Union Commission, Bureau of the Chairperson in Addis Ababa, Ethiopia. She holds a Master of Science in European Studies: Transnational and Global Perspectives from the K.U. Leuven in Belgium, and a Bachelor of Science in Political Studies & Industrial and Economic Sociology from Rhodes University, Grahamstown.